Department of Biochemistry, MGMCRIin association with 360HELP Diagnosticsorganized a4 days training programme on laboratory Quality Management and Internal Audit as per ISO15189:2012 from 11/4/2019 to 14/4/2019.A total of 19 delegates from in and around Puducherry, participated in the programme. Prof. Sumathi S, HOD Biochemistry welcomed the gathering. Honorable Vice Chancellor of Sri Balaji Vidyapeeth Prof. Subhash Chandra Parija inaugurated the programme at 9.30am with a special address to the gathering. 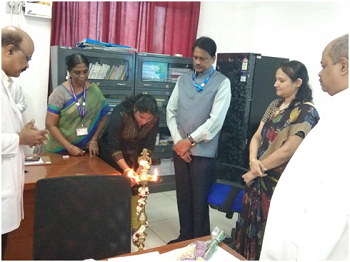 Prof. Joshy M Easow DMS Lab services gave an introduction on the theme of the programme followed by Dr. Kulkarni Sweta introduced the resource person Dr. Sowmya. K, Professor of Biochemistry, Sri Ramachandra Medical College and Research Centre, Porur, Chennai. Mr. Kuzhandaivelu proposed a vote of thanks. The training programme was aimed at imparting the knowledge about ISO15189: 2012 clauses and subclauses to the participants, which will enable them to become successful internal auditors. After completion of the training programme and assessment criteria, participants will receive the certificates from the Quality Council of India.